Traditional Underpinning is a method of retro-fitting a foundation when building a structure or when building a house. Traditional underpinning creates a foundation where one doesn’t exist or is entirely inadequate. The foundation is installed in segments, where the uninterrupted sections support the building until such time as the new concrete takes the load. The excavations are filled with re-enforced concrete and the re-bars are fitted in such a way, that they ultimately overlap and mirror a typical new found. The foundation is then strengthened in set stages. The foundation is strengthened in stages. The foundation is divided into numbered sections, which are typically 900x600x600 (LxBxH) but are ultimately dependant on site specific conditions under the foundation. Each excavated section is replaced with mass concrete and backfilled accordingly before proceeding to the next section. This limits any vulnerability of the foundation during the work. The foundation is divided into numbered sections, which are typically 900x600x600 (LxBxH) but are ultimately dependent on site specific conditions underneath the foundation. Each excavated section is replaced with mass concrete and back-filled accordingly before proceeding to the next section. This limits the vulnerability of the foundation when building a house or structure. 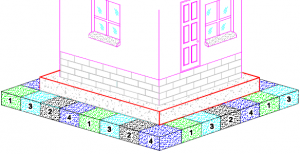 Traditional underpinning is most efficient with shallow foundations, as the largest cost is incurred during ground works. Once excavation depths exceed 1.5 metres, pressure grouting may be a more cost effective option. The loading capabilities are based upon the strata encountered. In some circumstances when the existing footing is adequate to span between supports, intermediate piers can be used to reduce cost. Occupants can remain in the property as work can be completed from outside. Method can be used in restricted access areas. Low cost solution at shallow depths. Minimal disruption and noise generated. If you are in the public sector, a developer or a contractor, and you are considering working with us in relation to traditional underpinning, contact us in our Dublin office on 01 6310300 or in our Cork office on 021 4345999.